The classic Mega Man games have always had a non-linear progression as a hallmark of the series. Instead of following a set path from beginning to end, you begin the game by choosing which level you will tackle in any order. Some levels may be easier than others. Each level has a Robot Master at the end which you must fight and defeat to beat the stage. When you beat a Robot Master, you will acquire his weapon for use in other stages. Each Robot Master weapon has its own energy meter and its own attack. One or more of the other Robot Masters will be weak to that attack. The designers of Mega Man intended the Robot Masters to each be weak against a specific weapon taken from another Robot Master and stronger or invulnerable to others. This rock-paper-scissors design would remain throughout the series. Mega Man and each Robot Master has 28 units of life energy. A weak attack may only take one unit, but a strong attack could take four or ten or fourteen. Mega Man's Arm Cannon would always take at least one unit for a successful hit, regardless of enemy. In the original Mega Man, each weakness had an easy to understand rationale. * - Unlike every other canonical Mega Man game, the Robot Masters weapons are not named in the game or manual. The manual also refers to the Robot Masters as one word, "Cutman", and identifies their and Mega Man's creator as "Dr. Wright." In the sequel it was firmly established as Dr. Light. Sometimes, the games refers to "Dr. Wiley" or "DR. WILeY", but the accepted spelling of the villain's last name is "Dr. Wily." Not all of these weapons are equally useful. Guts Man's weapon only works when there are rocks around to pick up. Bomb Man's weapon does not travel far and does not deal damage instantly, so it is usually limited in its application. Is it any wonder that these two weapons are nowhere to be found in the Gameboy game? Ice Man's weapon usually only freezes enemies and is useless against most Robot Masters. Fire Man, Cut Man and Elec Man's weapons are much more general purpose weapons. The latter two can cause even more damage to a boss by the select/pause button exploit. Some Robot Masters were made easier to defeat with the Arm Cannon than others, after all, the player had to find a way to break into this weakness loop. 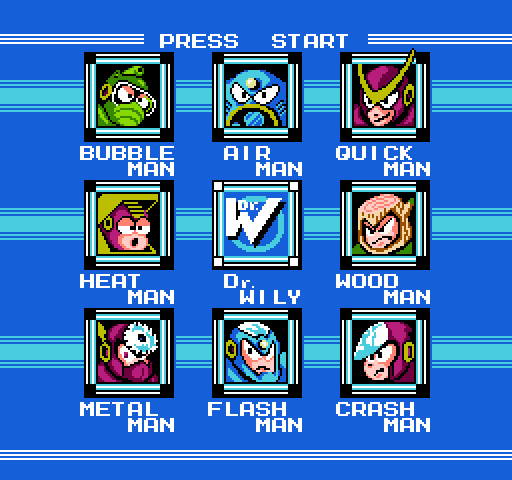 Most players usually start with Bomb Man or Cut Man. The Arm Cannon takes two units from Bomb Man and three from Cut Man, but Cut Man has to be fought in closer quarters and is more aggressive of the two Robot Masters. Guts Man and Fire Man can also be beaten with a little practice and a full health meter. Ice Man is more difficult because you have to follow his pattern very precisely and his projectile attack hits for a lot of damage. Elec Man is by far the hardest of the Robot Masters to defeat because he is aggressive and so fast that his patterns are harder to memorize. There is a special item you can obtain in this game called the Magnet Beam. It allows you to construct temporary platforms which you can use to walk or ascend the screen. It is behind three moveable blocks in Elec Man's stage. It is necessary in Dr. Wily's stages and extremely useful in Ice Man's stage. It is also very useful in Guts Man's stage, but you need Guts Man's weapon to move the blocks. Alternatively, you can defeat Elec Man and go back to his stage to retrieve the Magnet Beam using Elec Man's weapon to destroy the blocks. Mega Man allows you to revisit stages, but Mega Man 2 and 3 do not. Now let us turn to Mega Man 2. 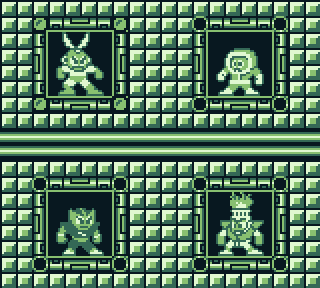 Mega Man 2 introduced the standard eight basic Robot Masters. However, they no longer are as grounded in basic concepts like their predecessors. The following assumes you are playing on the "Difficult" difficulty level, which is the only difficulty level in the original Japanese version. In addition to the above, Metal Man is even weaker to his own weapon than to anything else. The Time Stopper will only take half of Quick Man's life and thereafter the Crash Bomber is the weapon that will damage him the most. As you may have noticed, Flash Man and Bubble Man share the same weakness. The Atomic Fire weapon can damage many of the Robot Masters more than the other weapons, but the fully charged shot takes half of its energy meter. You can only defeat Wood Man using the Atomic Fire weapon alone. Some of these pairings make some sense. Time Stopper is a natural assumption to use against Quick Man. Bubble Lead, a water-type attack, makes sense against Heat Man. Moreover, Heat Man's attack pattern practically invites you to use Bubble Lead whereas Crash Man's pattern does not. Fire burns wood, so Wood Man's weakness makes sense. If you want to go out on a limb, I suppose you could say that the Leaf Shield can block the air intake of Air Man, who has a big fan in his chest. The Metal Blades can cut through the swim gear of Bubble Man. But why should Metal Man be weak against the Quick Boomerangs? Why should Crash Man be so weak to the Air Shooter? I don't really see the particular connection between Flash Man and the Metal Blades. You may note some similarities between some of the weapons in Mega Man and Mega Man II. The Quick Boomerang has an attack pattern nearly identical to Cut Man's weapon. Fire Man and Atomic Fire have similar weapon properties, as do Bubble Lead and Ice Man's weapon. Crash Man's bombs serve a similar function to Guts Man and Elec Man's weapons. Weapons are more unbalanced in Mega Man 2 than in Mega Man. The Metal Blade is easily the best weapon in the game, its fast, can shoot in eight directions, damage most enemies and takes quite a while to run out of energy. The Quick Boomerang can be useful and lasts a while, but its range is short. The Bubble Lead weapon has occasional uses. The Time Stopper runs down its energy quickly and is best suited to Quick Man's stage and Quick Man itself. Crash Bomber is best used for destroying barriers and is the only weapon that will work against the boss in Dr. Wily's castle, stage 4. Heat Man's weapon is slow to fire and a fully charged shot takes half the energy meter, so it is usually reserved for Wood Man and Dr. Wily's first form. Air Man's weapon is usually useless except against Crash Man and drains quickly. Wood Man's weapon is almost certainly the most useless in the game, when does a skilled player need its protection and it is a pretty weak attack. Even Air Man may go down faster to the Arm Cannon than to the Leaf Shield because his air jets can block the shield. There are three acquirable Items in this game. You acquire an Item by beating one of the Robot Masters. Item-1 creates up to three temporary platforms which hover upwards for a short distance. Item-2 allows you to travel across the screen in a flying platform. Item-3 allows you to climb walls. All three are necessary for Dr. Wily's Castle. Items 1 and 2 are especially useful in Heat Man's stage to pass the areas with the disappearing blocks easily. Although I do not find the original Mega Man to be overly difficult (anymore), Mega Man 2 added a password system and you could collect up to four disposable Energy Tanks that could refill your health meter at any time. These two additions made the game much more forgiving. For non-Japanese audiences, a Normal mode was added to make the game much easier to beat. In Normal mode, everything takes twice as much damage from your weapons and the enemies give better item drops. Mega Man 2's Difficult mode is the only mode in the Japanese version. Finally, I will talk about Mega Man 3. Mega Man 3 built on Mega Man 2's success and is a great game in its own right. Nothing has changed on the weapons front. Its weapons, however, leave even more to be desired. Magnet Man is equally weak against Shadow Blade. Shadow Man is also very weak against his own weapon. Except for Hard Man and Spark Man, the logic of the weaknesses of the Robot Masters here is beyond me. The best weapon in the game is the Shadow Blade. It can fire in five directions, has good speed, decent range and comes back to you. Essentially it is a more balanced version of the Metal Blade. Needle Cannon is also pretty good, it fires fast and lasts a while. Spark Shock is also fast and travels far. Search Snake is pretty limited in its usefulness and often really weak, the Gemini Laser is slow to travel, you can only have one shot out at a time and it takes several ricochets off walls for each shot to expire. Note that Search Snake has a slightly improved attack pattern over Bubble Lead. The Magnet Missiles exhaust themselves too quickly to be of much use. Hard Knuckle is so slow that it is really only useful to break down barriers and in boss fights, like Crash Bomber. Top Spin takes the prize here as the worst weapon in the first three Mega Man games. It is worse than the Leaf Shield, the Air Cannon, Bomb Man and Guts Man's weapons. There are three issues with the Top Spin. First, you have to be right next to the enemy to register a hit, leaving you prone to being hit in return. Second, the amount of damage it does is very variable. Third, it drains really quickly. You can spin against Shadow Man until Top Spin's energy is depleted and still not defeat it. The second time around, you will almost certainly use another weapon against Shadow Man. While there is one boss in Dr. Wily's castle that is vulnerable to the Top Spin, it is also vulnerable to another weapon, fortunately. Mega Man's companion/helper Rush is introduced in this game. Rush is a robot dog who can perform three abilities. The first ability is the Rush Coil and is present when you begin the game. It acts like a spring to allow you to jump high. The second is the Rush Marine and the third is the Rush Jet. The Rush Marine allows you to travel freely in water and is useful in Gemini Man's stage. The Rush Jet allows you to travel freely in the air and makes Magnet Man's stage a piece of cake as well as any other area with a lot of pits. Mega Man 3 allows you to collect up to nine Energy Tanks. There are some levels where you can get more than one Energy Tank or get one early in the level so you can collect them quickly. Additionally, the slide move makes its first appearance. With it, you can usually slide under any Robot Master who jumps and get away from them quickly. This makes using a Robot Master weapon a little less necessary in many instances. The Game Boy game is something like a remake or adaptation of the original game with elements of the sequel thrown in. The original Mega Man had six stages and four smaller parts to Dr. Wily's stage. For the small screen, some cuts had to be made. Gone are Bomb Man and Guts Man and their stages. Dr. Wily's Castle and Space Ship are longer than any Robot Master's stage. The game is six stages long, but the last two stages are quite difficult. The health and energy meters were decreased from 28 to 19 units. 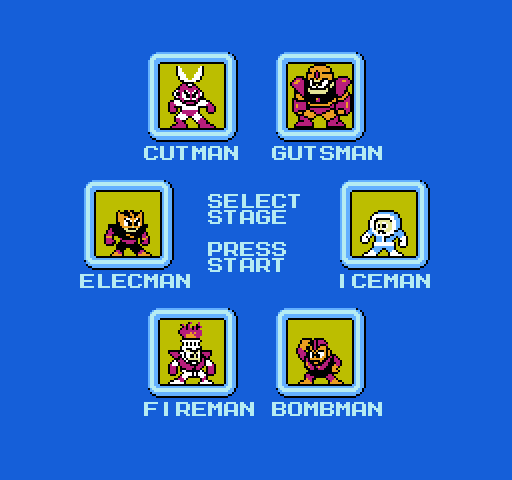 Cut Man, Fire Man, Ice Man and Elec Man are the Robot Masters you can choose from in this game. Fire Man's attack has been simplified. Elec Man has become much less aggressive and his attacks do far less damage, making him the usual Robot Master to start out with. Their weakness have not changed from the NES game, but the best weapon to use against Cut Man is Fire Storm. Their weapons are essentially the same as in the NES game. When you get to the end of Dr. Wily's Castle, you will see teleporters you can take in any order to fight Bubble Man, Heat Man, Flash Man and Quick Man from Mega Man 2. Their weaknesses have not changed, but the Metal Blade does not exist in this game, so you are intended use Atomic Fire against Flash Man. They really are not particularly weak to any of the weapons from the first set of Robot Masters. The only major change is that Heat Man's weapon does not take up as much energy for a charged shot. It can also destroy the barriers on Dr. Wily's Space Ship. Once you defeat the second four Robot Masters, you must fight Enker, who only is affected by the Arm Cannon. Enker gives up the Mirror Buster, which reflects enemy shots. Unfortunately, once you obtain their weapons, you have only one stage to use them. The final password only allows you to continue before Dr. Wily's Castle, so if you want to try to beat the game again you have to fight the Mega Man 2 Robot Masters again. There is one item that can be acquired in this game, the Carry item. You obtain it after you defeat the final Robot Master of the initial four. It creates a platform to the side or underneath you for a short period of time. Only one can be active at a time, but you can use it to save yourself from a deadly fall or spikes or to reach areas where you cannot jump to unaided. You cannot change to a weapon while it is active, but you can conserve its energy by leaving the screen it is on. Capcom used Arabic numerals to designate the NES games and Roman numerals (and the subtitle above) to designate Game Boy games on their respective boxes in order to tell them apart. I will do the same for this article. 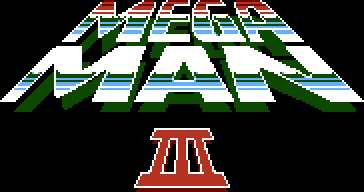 Mega Man II gives the other half of the Robot Master contingent from Mega Man 2: Air Man, Crash Man, Metal Man and Wood Man. 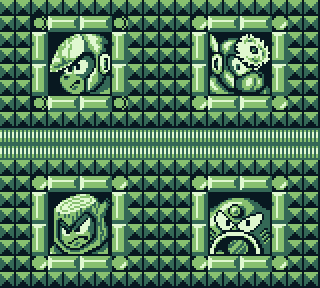 After you get to the end of Dr. Wily's Castle, you will be able to go through teleporters for new stages for half of the contingent of Mega Man 3: Needle Man, Top Man, Magnet Man and Hard Man. After you beat them and acquire their powers, you will fight Quint and obtain his power, the Sakugarne, which is a pogo-stick. Then it is onto the final stage, Dr. Wily's Space Ship. Other than actual stages instead of arenas for the second set of Robot Masters, not much has changed from its predecessor. Rush, Energy Tanks and the slide move make their Game Boy introduction. Rush transforms into the Coil, Jet and Marine. You can obtain up to four Energy Tanks in Mega Man II. I should talk about Robot Master weaknesses in this game, but this game is so poorly done that you can beat them all with the Arm Cannon. The Robot Master's attacks and patterns are fairly simplistic and do not usually do much damage. Quint is a joke and Dr. Wily's final forms won't cause you grief, unlike the previous game. The music stinks as well. Considering that the engine from the previous game was quite robust, the lack of inspiration in this game is appalling. Okay, so in this game, Metal Man is now vulnerable to Crash Bomber. On the other hand, Crash Man is not nearly as vulnerable to the Air Shooter, but it remains the best weapon to use against it. Neither Shadow Man nor Spark Man are present, so Magnet Man is now vulnerable to Needle Cannon. 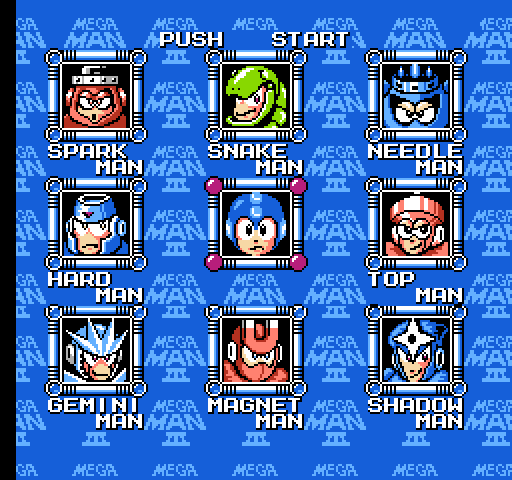 Similarly, Gemini Man is not present, so Needle Man is now vulnerable to Top Spin.